Author’s note: In addition to those names mentioned in the article Misses Caroline and Edith Vincent and Mr. Hector Vincent of Stony Mountain and Mrs. Lillian Grahame of Winnipeg confirm the location of the line in Stony Mountain. I received wonderful cooperation from the C.P.R., in the persons of Omer Lavallee of Montreal, Supervisor of Special Projects and Corporate Archives, and Joe Fisher, Ray Consatino, and George Moore of Winnipeg to help me substantiate that no records or maps of this loop existed. Conclusive evidence supports R. A. Quickfall’s statement on page 19 of the Rockwood Echoes that a railway loop passed between the hills of Stony Mountain. No maps have been found in the C.P.R. records to confirm this, but old newspaper reports and personal recollections of the old roadbed leave no doubt about its existence from 1881 to 1891. Its exact location at some points is in doubt, however. This article will discuss some of the evidence and, wherever possible, suggest the location of the line. As a small boy I remember the tracks and ties of part of what was left of the original railway being taken up during the First World War. Later, in 1934, when I was working for E. R. Mills of Stony Mountain he showed me where old lime kilns and railway beds had been located. The C.P.R. has no record of this line but, according to George Moore and Roger Letourneau who is writing a history of railways for the Manitoba Government, land title records show a construction line was built between Stony Mountain and Raeburn which was torn up in about 1882. Why is there no record of the line in Stony Mountain when its roadbed had existed until recently? Two railroad lines entered Stony Mountain from the south. The more westerly line, could have been the Selkirk, Rockwood, Woodlands & Western Counties Railway which the Manitoba Gazette of November 1879 stated was to have “power to build, contract and maintain and operate a single or double line of railway and electric telegraph from the town of Selkirk through the electoral division of Rockwood.” James Ross, Thomas Howard, Sedley Blanchard and S. L. Bedson were associated with this railway company. The line which approached Stony Mountain from the southwest proceeded northward from 1½ miles south of the Penitentiary, on the north-west quarter 35,12,2E., by the brick factory started by W. Morison and James Barclay, contractors for the Stony Mountain Penitentiary, through S. L. Bedson’s northeast quarter, 2,13,2E., skirting the west side of Target Hill and coming out just west of the Penitentiary cemetery by the gate post where cattle are let into the Target Hill pasture. No land was expropriated until Isbister’s property L.S. 10 north-east quarter 11,13,2E., to the east of the present Legion Building. Through that pasture a road bed was in evidence for several years. The line continued to the gravel pit and turned west along the edge of the hill. Isbister sold part of the northeast quarter 11,13,2E., for the C.P.R. right of way and for gravel and stone for $762.25. Turning west along Dufferin Drive the line came out on the west side of town between Macallister’s stone barn and stone well on the south and the ruins of Gunn’s kiln on the north. 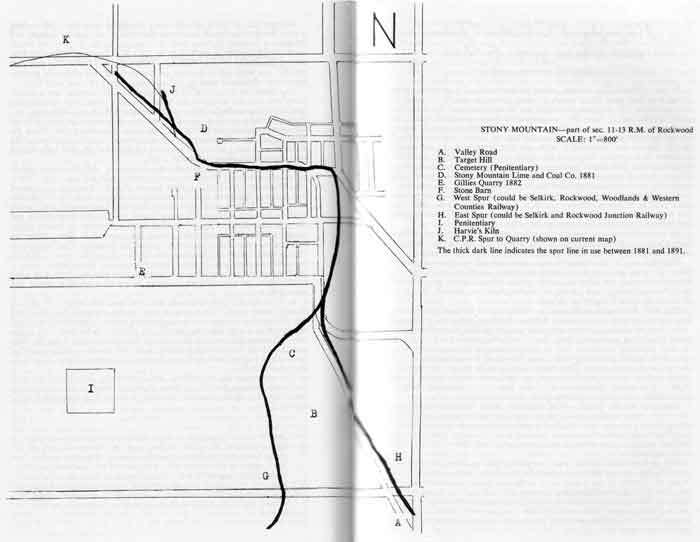 One branch veered right along Perry’s Road to Harvie’s kiln; the other continued just north of Dufferin Drive (which is the old Winnipeg Electric Road Bed) and over Vincent Road. I have no recollections of the line beyond this point because it was torn up when Gunn’s Spur was built in 1894. (It could have tied in to the Stony Mountain-Raeburn Spur to haul gravel and stone to the Rosser main line.) There being no Y in the gravel pit to turn around, the trains looped through the town. Another line of track entered Stony Mountain from the southalong Valley Road. This could have been the start or end of the Selkirk and Rockwood Junction Railway from St. Clements in the St. Andrews Municipality to Stonewall on the C.P.R. in 1881. (See Dorman’s Statutory History of Steam and Electric Railways of Canada 1836-1937) The rails and two flat cars were still in the bush on Valley Road near where the government road allowances meet on the south-east corner of town until 1935. The Manitoba Free Press on November 24, 1879 reports that a survey party was sent out to survey the Stony Mountain route after spending the summer trying to find a better route between Selkirk and Stonewall. According to the local story the survey was run in between the hills of Stony Mountain to take in the brickyards, lime kilns, stone and gravel. When the chief engineer saw this route he soon straightened it out to run west of the Penitentiary, stating he did not require a scenic route. The first train arrived west of the Penitentiary in October, 1880. Although never registered under the Companies’ Act, the Stony Mountain Lime and Stone Company was apparently well known in the 1880s. The Manitoba Free Press in 1881 reports that the company constructed two immense kilns and that a switch was to be run from the C.P.R. line immediately in front of the kiln where lime could be dumped and carried to the company’s yards in Winnipeg. James MacDonald of Winnipeg and Wm. W. Macallister of Stony Mountain were reported to be owners of the company. Macallister, who also owned the creamery in Stony Mountain had a stone barn and a stone wall around his property. The Marquis of Lorne visited Stony Mountain on his Western Canadian tour in 1881. I was told he came over the spur from the south to Macallister’s where a party was held on the top floor of the barn. The barn was built into a hill so that there were two ground entrances. It was often used for picnics and get-togethers. In 1894 Gunn’s Spur was built from the west side of town to Gunn’s Quarry where an old kiln is now in ruins to run eastward into the gravel pit. At least two reasons can be suggested to explain why the old road bed was not fit to use by this date and Gunn’s spur had to be built. One factor was the spring floodswith no drainage the railroad spur being the only dam across the fields would naturally wash out. Another contributing factor was the sudden death of Stony Mountain’s greatest booster, Col. S. L. Bedson, in 1891. The accompanying map shows the approximate location of the spur which ran between the hills of Stony Mountain. More precise information may become available when the Manitoba Archives map collection is catalogued.